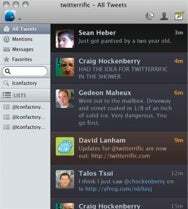 After two long years, the Iconfactory has finally released a major upgrade to Twitterrific, its popular Twitter client for the Mac. Twitterrific 4.0 gains a wealth of big improvements, including an all-new interface that brings it inline with the iOS version, support for multiple accounts and windows, improved theme control, and a slew of new keyboard shortcuts. A new collapsible sidebar (which you might recognize from the iPad version) houses quick access to your timeline, mentions, Twitter trends, and a search box. This upgrade also brings much-needed support for a number of features that Twitter and the third-party community have introduced over the years, like official retweets, viewing conversation threads, and translating tweets into your native language. The ad-free version costs $10 on the Mac App Store. Owners of Twitterrific 3 can upgrade at a discount by looking up their registration number and including it when they purchase it through Iconfactory's website. A free trial version is also available that includes ads and only allows one account per download.